With Father’s day around the corner, it’s time to start thinking of innovative and thoughtful presents that will earn you significant brownie points as the best son or daughter. Our Paintball days make for a brilliant bonding session with your father that you can both enjoy. Full day paintball experiences are held at 35 UK paintball centres and will guarantee lots of fun and laughter during a day of action and adventure. Delta Force Paintball offers players a wide range of themed mission scenarios that encourage teamwork amongst fellow players and strengthens bonds between mates. You can create lasting memories as you partner up with your Dad to secure the prized amulet in Tomb Raider or you can provide strategic cover using paint or smoke grenades as you storm the Zombies’ crypt and return peace to the land. Our paintballing experiences can be gifted to individuals, meaning your father’s day present can be sorted easily! Our paintball gift vouchers can be redeemed all year round and we tailor them to suit your individual budget.Our top-the-range paintball gear is included as standard with all paintball packages, and you have the option to add paintballs, an M16 upgrade gun or even grenades as part of your gift to your dad. 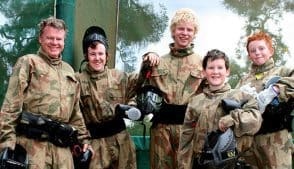 For more information about paintball gift vouchers or to arrange a paintball bonding session with your dad for father’s day, contact an event coordinator 24/7 on 0203 869 9301 or submit a callback request.